As public controversy over fracking ignites, here is our list of the bold and best creatives who cry "Frack off!" After their home in upstate New York was threatened with potential fracking, Yoko Ono Lennon and her son Sean spun the Beatles-inspired catchphrase in order to gather 200 fellow artists the founding of Artists Against Fracking in August 2012. Through “mass awareness” and “peaceful democratic action,” AAF seeks to expose and stop the contaminating effects of fracking for natural gas and oil. Check out their inspiring video below. You have to love the Grand Dame. Its one thing to make a political statement down the runways of London Fashion Week, and quite another to physically join a growing anti-fracking protest camp in West Sussex. Surrounded by thousands of activists, the fashion designer called Prime Minister David Cameron’s stance on fracking “outrageous,” and demanded a public debate on the issue. Westwood: "I'm anti-fracking and I'm here to protest. They are trying to rush this thing through, for what?... It's just storing up for the future, near future even, with financial problems and ultimately, you know, we'll all fry." Look out for anti-fracking T-shirt slogans and memorabilia at her next fashion show. Winner of the Special Jury Prize and Best US Documentary at Cannes 2010, Fox’s Gasland reveals the lucrative offers America’s rural landowners are being approached with by energy companies. The reason? These companies are hoping to tap into a reservoir dubbed the "Saudi Arabia of natural gas." Suddenly, America finds itself on the precipice of becoming an energy superpower or a toxic melt-down of epic proportions. Gasland Part 2 is now available on HBO. 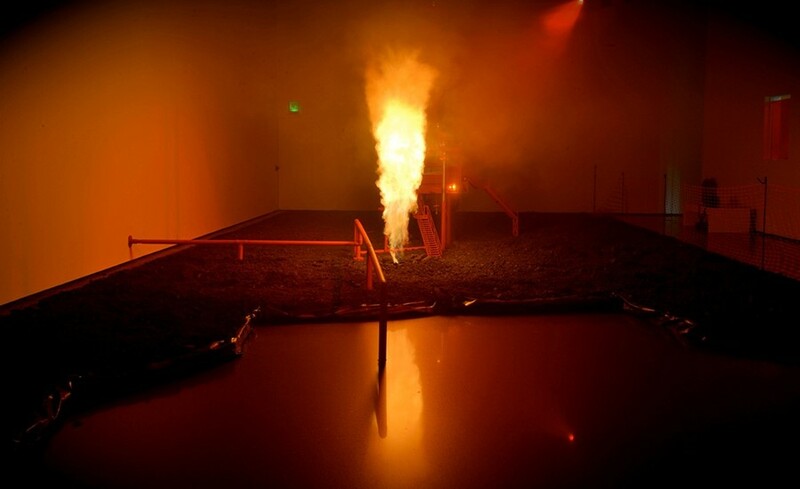 Though it may first remind you of a demented fairground ride, artistic engineering duo HeHe’s—Heiko Hensen and Helen Evans—in-door fracking installation at Liverpool's Fact gallery, "Fracking Futures," includes the eerie noise, tremors, and flames of a real hydraulic fracturing operation…and a pool of waste water nearby. Mini-disaster i the making? Hansen: “We decided to do fracking because it is a pressing issue. 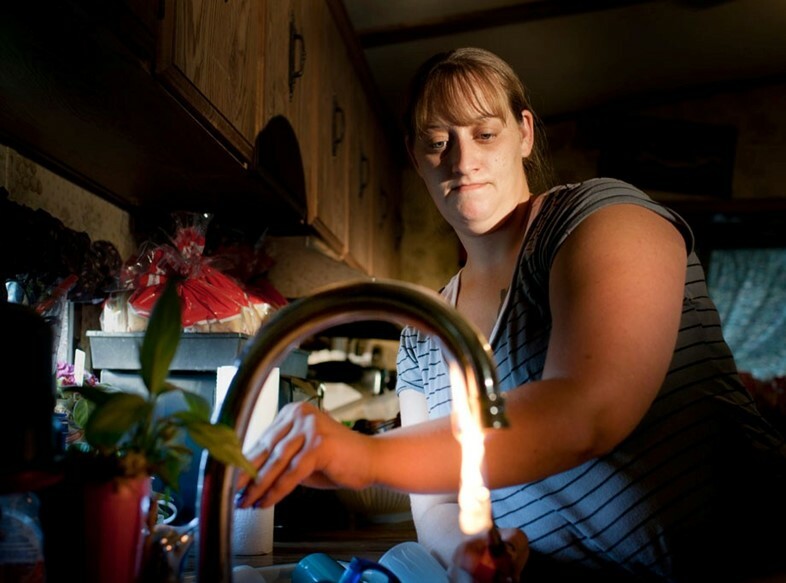 Everybody talks about fracking, but the iconographic image of it has not yet been found." Starring none other than Matt Damon, Van Sant’s Promised Land (2012)—portraying rather atypical subject matter—brought the politics of small-town America into the limelight of Hollywood and popular culture. Struggling with his own conscience in the film, Damon plays a natural gas salesman whose onerous duty is to sweet-talk locals into allowing his corporation wants to tap into the environmental resources. 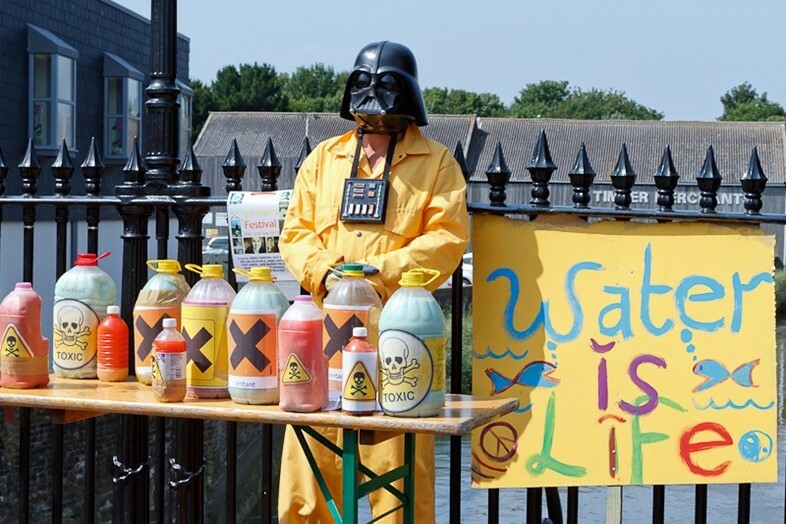 Luke held a zany anti-fracking performance in the center of Lewes, East Sussex that involved no less than a besuited fat cat, Darth Vadar, several people in chemical warfare suits, and copious bottles of coloured ‘toxic’ liquid. As drummers beat out a menacing rhythm, boatloads of Hazchem companies arrived to unload bottles of “toxic liquid” into the River Ouse. Then activists with feathers in their hair leapt onto the Hazchem boat, upending the ‘toxic’ water over company men’s own heads. Luke proved that its still possible to make political statements while retaining an exuberant, irreverent sense of humour. 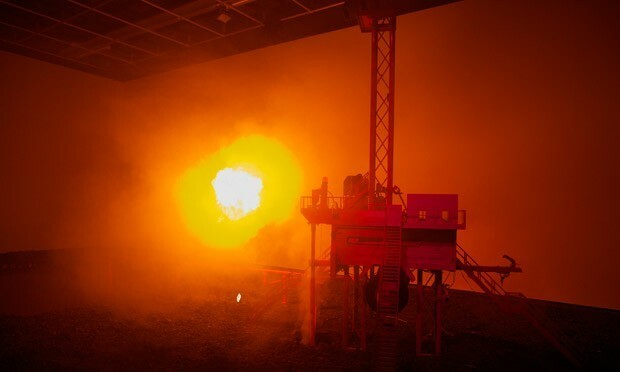 Inspired by fracking technology and a scientific background, Booras’s ceramic drill bits were inspired by the diamond drill tools used on the exposed portions of the massive Marcellus shale formation in upstate New York. His One Cubic Foot is exactly what it sounds like—a cubic foot of Marcellus shale, glaze-fired to fuse multiple layers of rock. The team behind the ”You Don't Own Me" video is back with a new star-studded video for Yoko Ono and Sean Lennon's Artists Against Fracking. The anti-fracking cause is taken up by celebrities including Joseph Gordon-Levitt, Adrian Grenier, Susan Sarandon, Maggie Gyllenhaal, The Strokes, Lindsey Wixson, and, of course, Yoko Ono herself, singing along to a song titled, "Don't Frack My Mother." Watch out for Reggie Watts's brilliantly sinister interlude.